The eel garden stretched out before us, hundreds of slender bodies waving like blades of grass as their tiny heads bobbed to the beat of their own drums. As we cruised above them, the garden eels slowly slipped deeper into their burrows until only their heads were visible. After we had passed by, they regained their confidence and rose out of the sand again. In most places an eel garden is a very small patch of timid creatures that disappear at the first sign of divers. On Menjangan Island however the eel garden is more like an eel field that stretches as far as the eye can see in all directions. Lying just a few miles from the remote western tip of Bali, Pulau Menjangan (Deer Island) is part of a large national park. 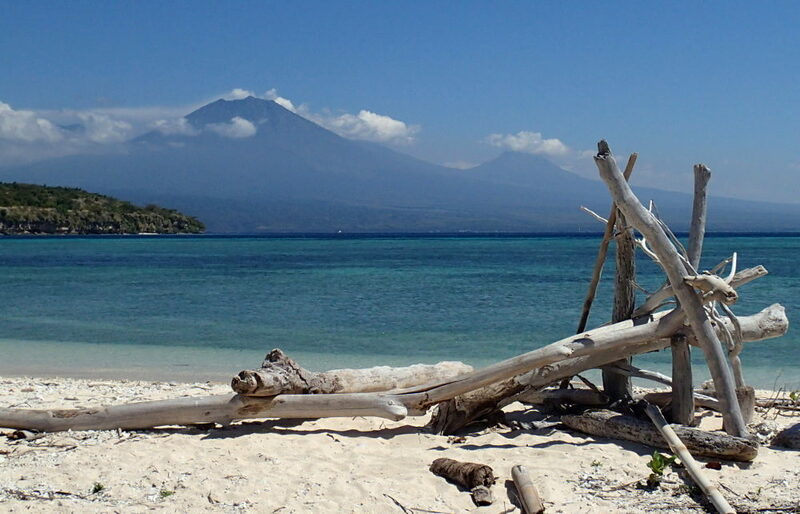 Pristine white beaches give way to magnificent views across the sea to the imposing volcanoes on Java. Uninhabited except for the handful of monks at the temple and a team of park rangers, this picturesque island is the perfect destination for a boat trip. Menjangan Island is named after the herd of Muntjac deer that live there. Local people once claimed to see deer swimming out to the island each spring but these days they are year round residents. We visited during dry season and saw several deer around the shoreline. In the wet season, when water is plentiful, the deer head inland where visitors are less likely to see them. 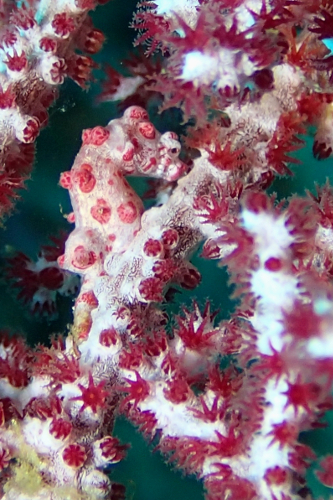 Can You Spot The Pygmy Sea Horse? 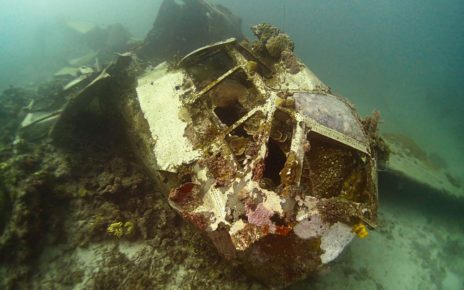 For many visitors however, Menjangan Island's main attractions lie beneath the surface. The varied topography and a healthy coral reef system make the dive sites around Menjangan Island some of the best in Bali. At the western end of the island, the white sandy slopes are home to all kinds of interesting creatures. 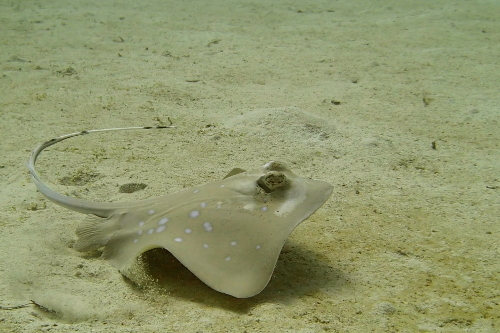 We saw jawfish and mantis shrimp peering out of their burrows and blue spotted stingrays cruising across the sea floor. The coral outcrops, swarming with tropical fish, were islands of colour against the pale sand. 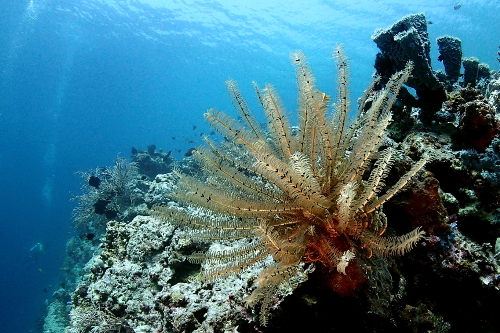 They were home to some spectacular red and white fan corals. Looking closely we were able to spot some tiny, well camouflaged pygmy seahorses hiding among the branches. 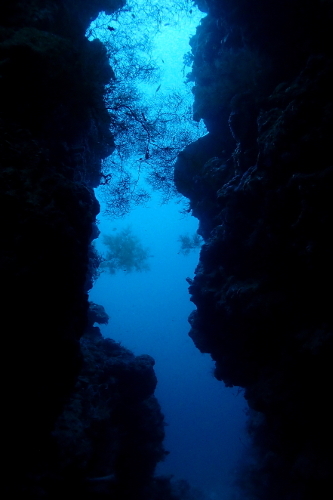 Further east, we dived some of the vertical cliffs that plunge into the depths. Huge gorgonian fans and fern-like feather stars blurred the lines between animal and plant and brought these sheer walls to life. 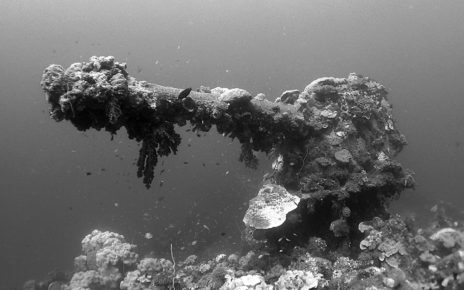 We found two gargantuan frogfish perched precariously on a narrow branch of coral and wondered how old they must be to have grown so large. Later, at the back of an underwater cave, we saw electric clams crackling with blue lightning. Thankfully this is just an impressive special effect so there was no chance of a shock. Is It An Animal Or A Plant? Menjangan Island is the main reason tourists visit this area so the local resorts work hard to protect it. They organise regular island clean ups to manage litter and remove the flotsam that washes up on shore. Most of the boats used by tourists are owned by the local villages. This ensures that tourism has economic advantages for the whole community, not just those lucky enough to work at a resort. Although Menjangan Island is popular with day tripping tourists, you'll find this part of Bali much quieter than hotspots like Ubud and Kuta. It is particularly well known for snorkelling and scuba diving but it does also have perfect beaches and is a great place for a picnic. In contrast to the rich coral reefs at the island, divers staying in this area can also enjoy some fascinating critter diving around Secret Bay. Some dive operations also offer the chance to spend an evening with Mandarinfish. Menjangan Island is a long drive from Bali's other tourist hotspots so it's worth spending a few nights in this area. It is easy to book a taxi through your accommodation. The closest accommodation to Menjangan Island are the luxury resorts around Pejarakan. They are only allowed to use the boats offered by the local villages. These wooden vessels are generally reliable but can be a bit scruffy. Pemuteran can be a more economical place to stay but it is much further from the island. Boats from Pemuteran tend to be newer and faster because the journey is so much longer. Many thanks to Mimpi Menjangan for their kind hospitality. 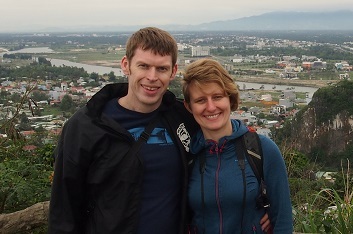 Their friendly staff offered an outstanding personalised service, which really made our stay. Not to mention the abundant wildlife, including everything from monkeys to mudskippers and mandarinfish only a five minute boat ride away.